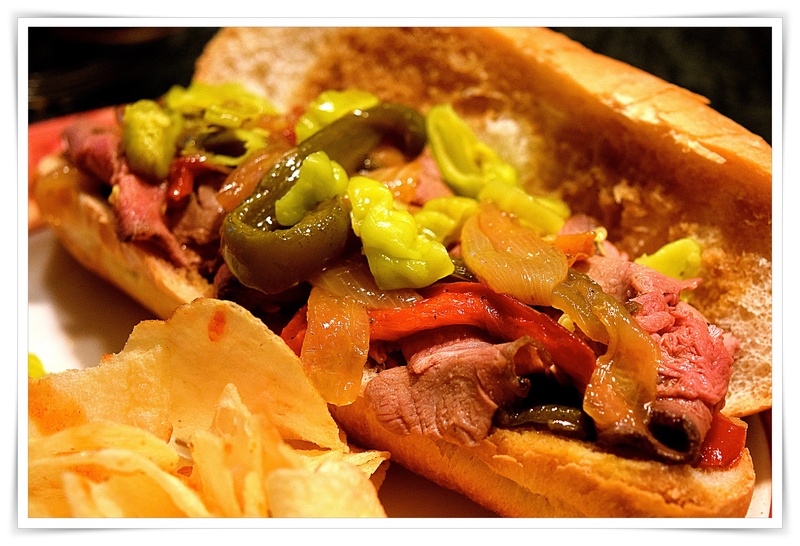 One of the many tasty treats in Chicago is a soft Italian roll or hoagie roll filled and dripping with thinly sliced Italian beef that went for a bath in roasted beef juices and dressed with peppers, onions, and hot giardiniera…Italian beef a mainstay for all kinds of parties and football games. You usually can find a good Italian beef anywhere and a lot places have a party pack kind of setup for a large gathering, so I really never actually made Italian beef from scratch until today. 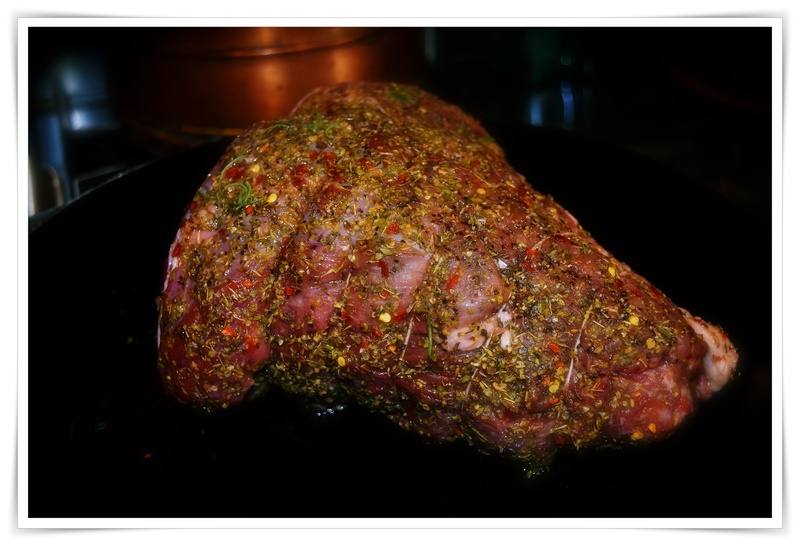 Generously season a roast that has been studded with garlic and rosemary with dried oregano, dried basil, dried marjoram, salt, pepper, red pepper flakes. I sprinkled a little onion powder and paprika over the roast so many options out there’d I need to experiment further with the seasonings to get the flavors that I recall. One day maybe I’ll order the blended spices from The Spice House sounds like a winner to me. Clever people they are! I didn’t want to go the slow cooker route the first time and chose to start with a hunk of sirloin tip roast well seasoned with the flavors used in some of the recipes that I looked at adjusting here and them to my own taste. The roasting time after browning the roast stove top is not that long in a 325º preheated oven and only reaches a 130º internal temperature…yes rare or no more than just barely there med rare temp. The meat basically cooks more while taking a nice hot bath in the beef juices. Just slightly cooled and tightly wrapped in foil for a nice long chill in the fridge so that the meat can be sliced paper-thin on the slicer. 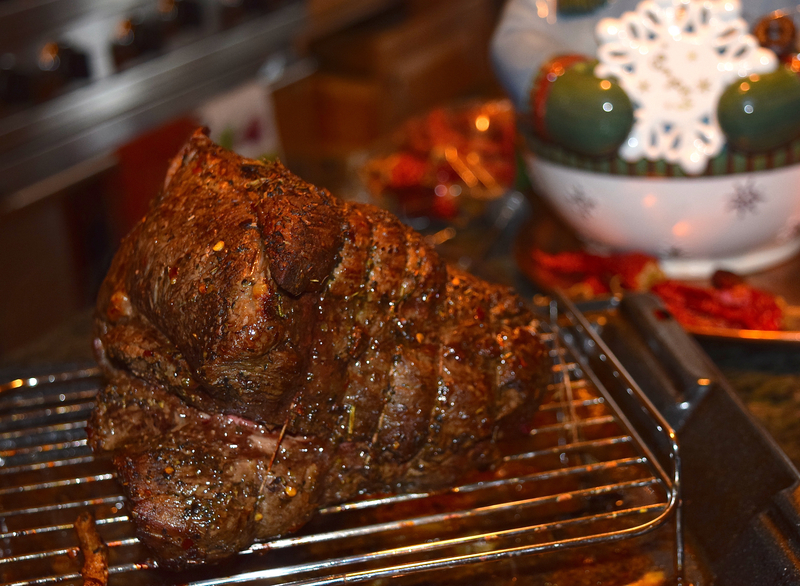 Now when it comes to the beef juice I read many opinions and methods until finally settled for a combination of things, including the deglazed pan juices from browning the roast (use some beef broth or stock to deglaze) before placing it in the oven . A note here, I tossed in a thickly sliced sweet Vidalia onion before deglazing the pan and adding a combination beefy things that I had on hand since I am in no position to go gallivanting about for ingredients. I tossed in some beef broth, veal stock to equal about 8 cups of broth and cooked it down for about 15 minutes before adding 4 cups or so to the beef roasting pan.